It takes money & knowledge to build wealth. So to become wealthy you must gain money and financial knowledge. You can get a good amount of financial knowledge from finance books. There are number of books available in market, hence sometimes it is very difficult to select correct book. To help you out we are herewith collection of 10 best finance books. Majority of these books are best-selling books. These books will surely inspire you to gain financial success. The Intelligent Investor finance book is written by Benjamin Graham. This is the best book for investor as per Warren Buffet. This book gives valuable information about investing especially in stock market. Underline message given in book is you should carry out deep and through research before investment. The Millionaire Next Door is book written by Thomas J. Stanley & William D. Danko. They studied profiles of millionaires to find common traits among them. As per book millionaire does not believes in show off. They spend within their means. They thought their child to be self-sufficient and prudent in spending money. Rich Dad, Poor Dad is good finance book written by Robert Kiyosaki. In this book Robert talks about his rich dad and poor dad philosophy and way of looking at money. He use cash flow quadrant to explain about how rich and poor lives. In this book author is using simple yet very effective way to explain things. Think and Grow Rich book is written by Napoleon Hill. Before writing this inspirational book Napoleon hill researched and interviewed thousand of successful people including Henry Ford, Thomas Edison, Alexander Graham Bell, John D. Rockefeller etc. In this book he captures details what makes these people successful. This finance book is written by Suze Orman. In this book Suze explains how to be young and fabulous and not broke. In this book author talks about credit card, student loans, credit score, insurance fact, buying first home and many more. This book is must for today’s young generation. Secrets of the millionaire mind is book written by T.Hary Eker. This wonderful book talks about mind and the beliefs of wealthy people. This book also includes excellent strategies and plans for you to change your money blueprint and reach financial success. Common stocks and Uncommon Profit is book written by well-known Investor Philip Fisher. This book talks about stock market. In first phase he talks about 15 points to look for in common stock. In second phase talks about other basics including what and when to buy, as well as when to sell stocks. This book is written by Jerrold Mundis. In this book Jerrold share simple and effective ways to free yourself from debt. If you are under debt and want to get out from debt to live prosperously this book is for you. The Automatic Millionaire is book written by David Banch. He is known as rich series author. In book The Automatic Millionaire banch share story of average American couple. Underline fact of this story was you have to make plan to pay yourself first automatically. This plan will automatically secure your future and present. Financial Life Planning is book by Indian Author Mr.Hemant Beniwal. This book talks about financial life planning. In this book author also talks about important topics like financial planning, budgeting, debt, insurance and investment. 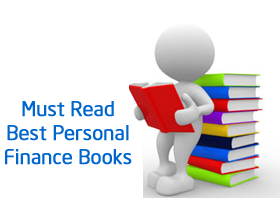 Thanks for reading list of best personal finance books. Please leave your comment and let us know your views about these books. Also let us know if we missed any book which you feel to be included in this list. « How Google can make you financial independent?